Daniel Muessig video: The man behind the best (or worst) lawyer commercial ever made speaks out. 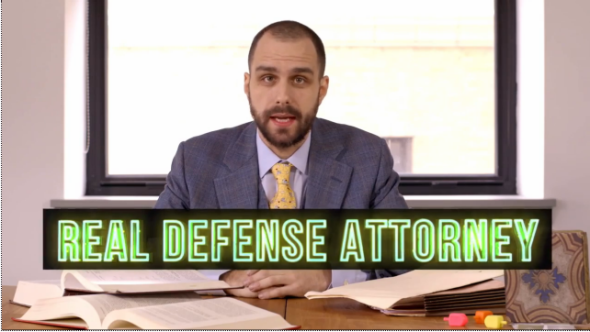 The man behind the best (or worst) lawyer commercial ever made speaks out. Dan Muessig: I’ve definitely gotten a lot of phone calls from clients. And from the media, too, obviously. I guess that’s par for the course when you go minorly viral. Slate: How do attorneys usually connect with clients? Muessig: My area of law—criminal defense—is really stale in terms of how lawyers find clients. There’s an enormous divide between who the lawyers are and who their clients are. There’s not as much of a divide with me. Lawyers are generally finding clients through court appointments, or else they put out billboards, bus station ads, print media. Really traditional stuff. It’s mostly just word of mouth, honestly. The group of people doing criminal defense as a profession is really small, and the people who are committing crimes for a living is very small. When you do good work for people, word starts to get around. Slate: Why is it that you’re closer to the criminal community than most lawyers? Muessig: It’s my association with rap music and the hip-hop scene. That’s not to say rap music is inherently criminal—that’s very much not true. But rap put me in touch with a wide variety of people. It had me on the street a lot as a young man. I got to meet a lot of different kinds of people. And going to public school in the city, I formed friendships and associations that the vast majority of lawyers just do not have. That’s how I got into this weird position, where I have a foot in both worlds. Slate: Beyond connecting with clients, how can what you call “street knowledge” be an advantage for a defense attorney? Muessig: The most important thing to me is helping a client out. … You have to know what your client wants out of the situation. You have to be able to say, “I know you, I understand where you’re coming from, and what your aims are,” and be able to build your defense around their needs. You don’t want to be the typical white guy in the suit who’s going to impose his worldview on the client. That’s, honestly, the attitude of most lawyers working today. There’s been some diversification in the field over the past 50, 20, 10, five years, but it’s still an overwhelmingly old, white, male, moneyed profession. It’s a lot of patrician guys talking down to people who are in their office. There’s a lot of condescension. If you come at it with a knowledge of the streets, what these people are facing, and how it affects their lives, you can really focus on how best to help them. Slate: Tell me about how you decided to become a lawyer. Muessig: In my 20s, I was touring a lot, and I felt like I wasn’t really doing anything, you know? I was doing shows and making a living and traveling a lot, but I was just kind of running in place in my life. Same countries, same cities. I hit that quarter-life crisis where I decided wanted to do something more. It came down to my skill set: I’m never going to be a person who builds websites. I’m not going to be a doctor or scientist. But I’m good at improvisational argument, talking to people, reading, and writing. These are skills I got from rapping and freestyling, and stuff like that. And I’m good at running my own business—when I was on tour, I sold my own DVDs and my own T-shirts, all of that stuff. I realized that if I could pass the LSAT and pass the bar—which were not exactly givens, by the way—I could become a criminal defense attorney, work for myself, do what I’m good at, and use it to help people. Slate: In school, did you notice a cultural difference between the law students who wanted to become prosecutors and those who became defense attorneys? Muessig: Criminal law is very much maligned in law school. Hardly anybody in my class wanted to go into criminal law. They were shooting for corporate law. It seemed like a transactional choice for them. They were more concerned with money. In criminal law, no matter what side you’re on—whether it’s the prosecution or the defense—you’re working in what, for a lawyer, are pretty poor conditions. You’re dealing with a lot of difficult people for relatively low pay. Of the low number of people I went to law school with who wanted to go into criminal law, maybe five people wanted to do criminal defense, and the rest wanted to be prosecutors. Those people tended to be a little more straight-laced. By the book. Trusting of authority. That’s not me. I was a really horrible student in law school. I was a rebel, I flouted authority at every opportunity, and I graduated near the bottom of my class. I had zero respect for most of my teachers. And a lot of people who end up in criminal defense start off on the prosecution side. I was a rarer bird in that I went straight into defense work and that probably has skewed my worldview a bit. Slate: What do your colleagues think of your advertising strategy? Muessig: It’s been largely supportive. There are some people who are like, “Take that commercial down, you’re a disgrace to the profession.” But 90 percent think it’s awesome. I understand that some people are going to be angry at the ad, but I don’t really get angry about anything anybody ever does. Slate: Has anyone actually been surprised that you would do this? Muessig: It depends how well they know me. It’s not like I come into court wearing a Viking helmet or something. I conduct myself well in court. I throw a “your honor” in front and behind every time I address a judge. In court, you wouldn’t be able to look at me and know what my deal is. The only thing that makes me stick out is that I’m relatively young and my suits are particularly flashy and expensive. Coming from the hip-hop culture, it’s important to be fresh at all times. I always had a closet full of Polo and shelf full of Nike shoes. Still do. It’s part of the ethos. Your style is part of the total package of who you are, and I took that to heart. All of the criminal defense attorneys of yore that I followed and looked up to, they were sharp and flashily dressed, too. French cuffs and crazy ties, silk suits. I remember when I got my first Brioni suit. I was really, really happy that day. Slate: Anything else you want the public to know? Muessig: I did this to connect with clients and help people. As crazy and heavy-handed as the commercial is, it’s a send up of that typical lawyer trope. Anybody I’ve actually represented in court can tell you that I’m conscientious, I care, and I work hard for my clients.